Like many of you, I’ve started my three month test drive of Apple Music. I’ve been a paid Spotify user for about a year and a half. Before that, I listened to a lot of Pandora and sniped $5 digital albums monthly from Amazon. It was a revelation when I tried Rdio and Spotify. I essentially kissed my own music collection goodbye and dove into the ocean of most of 20+ million songs. With no requirement of buying an album or individual songs after clicking around a web page, it can be addictive to explore in any direction you’re in the mood for. It is a much different experience than shopping for individual $1 songs or $5 albums. Spotify excelled at that and has only gotten better. Because that’s the game: exploration of content. My older son initially resisted an account but I gave him a $5/month additional account and watched what happened. Now he’s built me a list of over 300 songs I listen to regularly. And that is exactly where I see Spotify shining and Apple falling short. I read the reviews of Apple Music and gave it a shot but am missing a lot of what I use often in Spotify. It’s got some nice features, but I hit numerous roadblocks. I’m going to spell out exactly what I mean. What if I’m in a different mood than Apple thinks I am? Spotify offers me playlists categorized based on what I’m in the mood for. It also overtly learns what I listen to and when. I created a London Grammar playlist a few days ago and listen to it while cooking. 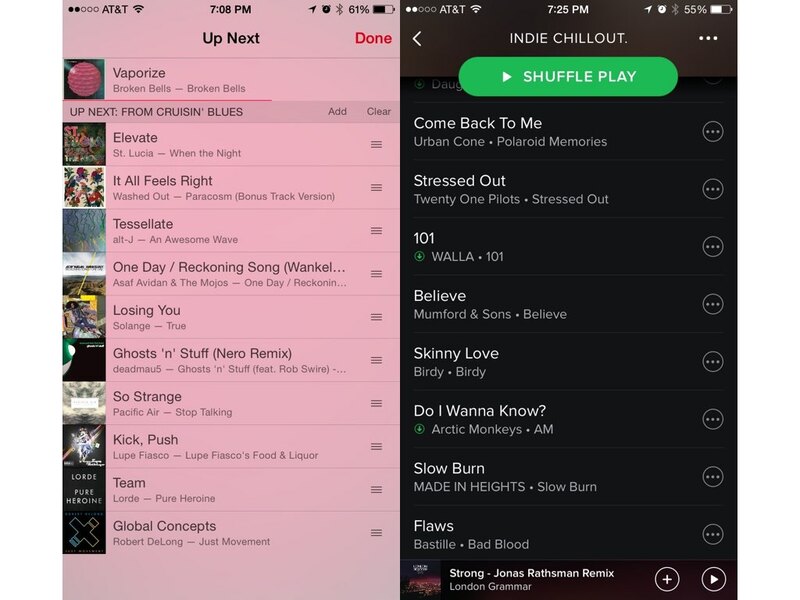 It’s there in Early Evening or I can swipe right for other music I listen to or Spotify playlists. There’s a massive amount of science involved here and Spotify bought the company to power it: Echo Nest. If you are at all a data geek, music geek, or curious about what “Big Data” is and how it impacts your life then research it a bit. This article on Tech Crunch is a good start. And I mean even slightly interested. 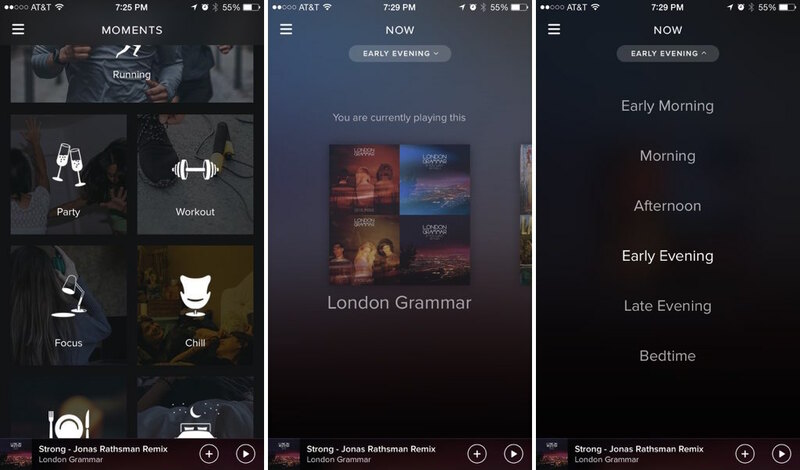 Spotify is naturally tuned to help you start exploring the same way Facebook is tuned to helping you communicate. Listening to a playlist. What now? OK, above I’ve found a playlist and am listening to it. Now what? 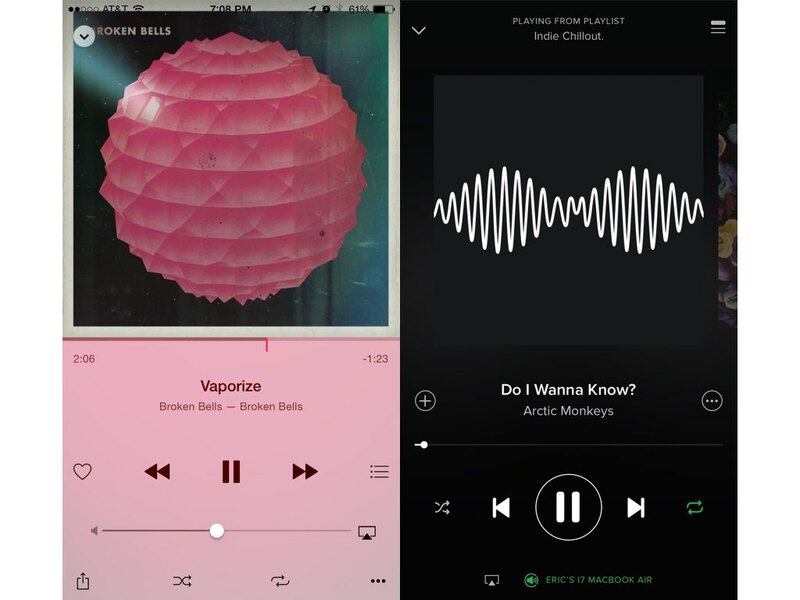 Here’s one of Apple Music’s on the left and a Spotify playlist on the right. 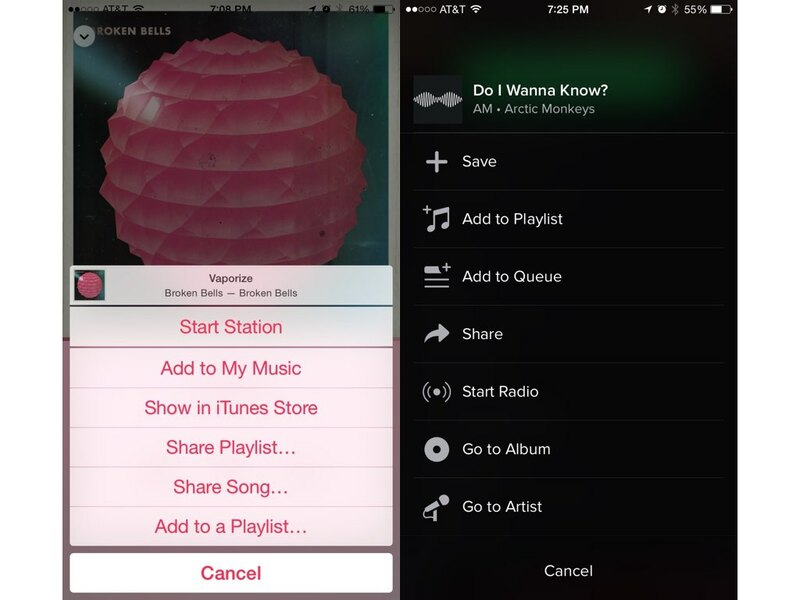 The easy difference in look is Apple’s UI design which is letting the Broken Bells cover design turn the screen pink compared to the black look of Spotify. I don’t have a huge preference here. The bighugemassive difference is the hamburger vs. the ellipsis. Tap the three hamburger lines in Apple Music and you can shuffle the order of that song. It’s pretty useful and Spotify doesn’t do that. Note how many places you see that (…) in Spotify: At the top of the playlist and each song. It’s also there when you’re playing a song with cover art. I get back there by tapping Done on Apple Music or the bar at the bottom of Spotify which also has play /pause and a + button to add the track to my library. I’ll talk about that ellipsis in just a second. Listening to tunes. Apple Music and Spotify. Here are the track screens. One minor difference is that on Spotify I can swipe right for the next song – you can see it peeking out from the edge of he screen. I feel like a baby trying to read a magazine when I try that on Apple Music. Also, notice that I’m browsing music and taking screenshots from my iPhone and my headphones are plugged into my Macbook Air. Spotify Connect lets me do that and you can see it next to the Apple AirPlay icon at the bottom of the screen. I could be streaming on my iPad, my Playstation, or my iPad. Any app can play and any app can be a remote which makes multi-screening seamless. You can switch from headphones on your phone to playing over a stereo without losing a beat. Apple Music doesn’t do that. I use it a lot. Back to more exploration and the ellipsis. Let’s say that I really like Vaporize or Do I Wanna Know? and want to find more tracks like them. I use that ellipsis button on both apps and this is what happens. Both let me save the track, both let me share the track (Spotify’s got more options here and a bigger internal network), add it to a playlist, or start a radio station playing more songs like this one. Spotify also has a Queue to simply string together songs without bothering to build a playlist. Where Spotify really shines though is Go to Album or Go to Artist. If I want to do the exploration then I can dig for whatever I want effortlessly. With Apple Music, I’m at a brick wall. That’s it. Game over. The rest of the music universe starts here. 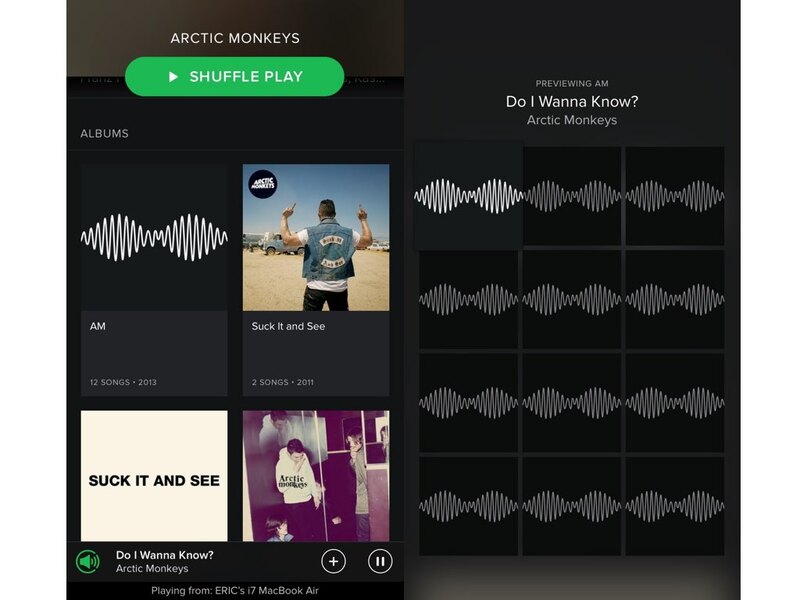 I’ve done exactly that and am now at Arctic Monkeys’ page in Spotify. All their albums, songs, and related artists are here. I can browse through them and use the ellipsis to visit each one as I choose. Each has the same popup you saw above. Jumping from band to band is fast and beautiful. Look at the grid above which says PREVIEWING AM | Do I Wanna Know? | Arctic Monkeys. I held my finger down on the album on the left screen and the song I was listening to paused and the grid popped up. I can now slide my finger around each song and preview a slice of it. When I let go, the song I was originally playing resumes. This lets me sample anything I want without losing myself or interrupting what I’m listening to. I can then dig deeper, try another album, or band, or just keep listening. Again, this works everywhere. Even in playlists where you can save the song or add it to the play queue. It’s immersive. There you have it. Simply put, the job of a service like this is to help you to more music. Music you know well, music you may have heard of, and music which is entirely new. I asked my thirteen year old and he gave me that exact answer. Apple has the content and they’ve put the emphasis on serving that music to you the way they think you’ll want it. Spotify has better science which they’ve used to power your exploration through a far better experience. That’s why Apple Music emphasizes curation. Don’t get me wrong. It’s nice, but it’s limiting and they’re compensating for Spotify and Echo Nest’s deep understanding of how people really traverse the musical oceans. Any thoughts on this? Add ’em below. This was on my list to do. As usual, writing about it clarifies things for me. Apple Music can fix these things, but I think they were targeting people who’d love their service based on 20 song playlists. That’s just not enough IMO. Presumably they know their market, but I’m in the more mature user space even if I’m not a music aficionado.